The United States Department of Agriculture (USDA) offers a loan program known as the USDA Guaranteed Rural Housing Loan or just USDA Rural Housing. This program has been around for a number of years and is a great option for buying a home. The details of the program are discussed at length below. The best feature of the USDA mortgage is that there is no down payment requirement. USDA guidelines allow borrowers the opportunity to borrow up to the home’s appraised value, plus the USDA upfront guarantee fee. However, you are not required to finance the upfront guarantee fee. Besides the VA mortgage, the USDA loan is the only mortgage that allows this type of financing. People that have a solid income but little savings can really benefit from this loan. This is the single qualifying factor that can stop people from using the USDA mortgage to purchase a home. In order for the property to be eligible the home must be located in an area that is clearly marked “rural” by the USDA. However, that is a simple qualification to meet. The current areas eligible for USDA financing composes more land than you would think. To put it simply, if a potential home buyer looks at 10 prospective homes in their area, chances are good that 8 or 9 of those homes will be eligible for the USDA loan. Our loan officers have access to the most recent USDA maps and can answer questions about any prospective home’s eligibility. The property must also be the prospective home buyer’s main residence. USDA does not approve borrowers that have an existing mortgage and intend to keep the other property. In addition to the above restriction the buyer may not own another property within reasonable distance to the prospective new home. The income limits imposed by the USDA is the second factor that could prevent a person from qualifying for a mortgage. Since the program was designed for rural areas, the guidelines state that qualifying borrowers should have moderate income. Moderate income sounds like a subjective term, but the USDA has some very detailed instructions for calculating a borrower’s income. If the borrower’s household income is less than 115% of the median income of the area then the borrower’s income level is approved. It is important to note that household size is used in the calculations. The yearly earnings from all of the people that live in the home and have a legal source of income will be totaled together. The income levels vary for each county within each state and also vary based on the number of people living in the home. USDA has no written limit on the amount that can be borrowed for a mortgage. While conventional loans and FHA may prevent borrowers from buying a home above a certain price point, USDA has no such restrictions. USDA has no limit on the amount of money that can be borrowed for a mortgage. To be fair, this does not mean that every borrower that qualifies for a USDA rural housing mortgage can simply buy the most expensive home in their area. The borrower’s debt to income ratios must meet certain rules which are very similar to the FHA rules. Debt to income is a calculation made for most every type of mortgage loan. It compares the borrower’s monthly gross income to the borrower’s debt payments. As long as the ratio is within certain limits then the borrower has a chance to get approved for the mortgage. For USDA, the proposed payment on the new mortgage should not be over 31% of the gross monthly income. All of the borrower’s debt payments, including the new mortgage payment, should not be over 43% of the borrower’s gross monthly income. The reason for this is twofold: it prevents the borrower from getting a mortgage that is too much to handle. It also adds some assurance to the lender that the borrower will have the ability to repay the mortgage. Each type of mortgage loan has its own set of guidelines for the type of credit that will be approved. The rules and guidelines for USDA are lenient and are close to the guidelines for FHA. This means that past late payments, charge offs and other negative items that have occurred more than a year ago may be overlooked during the underwriting process. In addition, consumers who do not have traditional sources of credit have been able to get approved for a USDA loan. The underwriter can use payment history from utility companies, cell phone companies and automotive insurance carriers to determine the credit risk for the borrower. Even a pattern of regular deposits to a savings account can be used to determine a borrower’s credit worthiness. However, the non-traditional sources of credit cannot be used to overcome existing negative credit. This type of manual underwriting is only used in the rare circumstance that a person has no verifiable credit history. Since USDA rural housing loans offer no money down option this means that the lenders are taking on 100% of the risk that the customer will repay the loan. In order to safeguard against this risk there is a fee charged called mortgage insurance. USDA charges an upfront mortgage insurance as well as yearly mortgage insurance, both of which can be added to the loan. USDA will charge 1% of the total outstanding loan as a guarantee fee. This amount is allowed to be added to the loan and financed over time. Along with the guarantee fee charge, USDA will also charge 0.35% of the loan’s outstanding balance each year as a separate fee. This fee is divided by 12 and added to the monthly mortgage payments made by the borrower. These items, along with other closing costs, can total up to thousands of dollars. The seller can pay closing costs or the buyer can get a gift to cover the costs. The buyer may receive a gift to cover the closing costs. USDA requests that such a gift is accompanied with a letter explaining the gift and nature of the relationship between the home buyer and giver of the gift. The seller may pay part or all of the closing costs. There are limits to what can be paid. If the buyer intends to negotiate with the seller to pay the closing costs then the buyer should speak to a loan officer experienced with USDA mortgages in order to understand the limits. For all of its advantages, the USDA mortgage program does have a few restrictions in place for prospective buyers. USDA loans cannot be used for investment property. As mentioned above, the borrower must live in the property as their primary home. 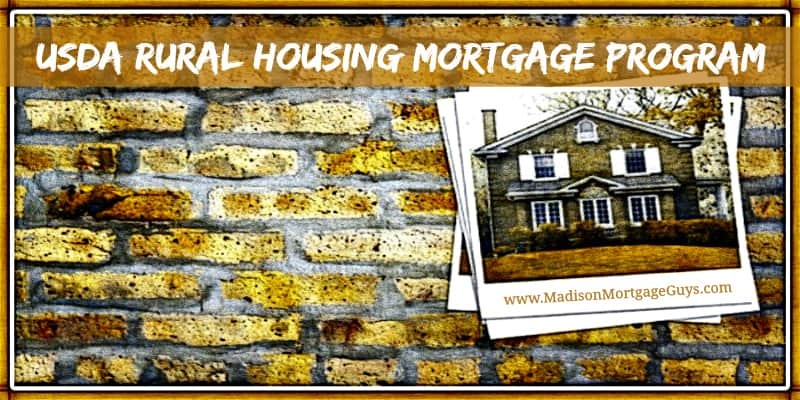 The USDA mortgage is NOT reserved just for first time home buyers. People that have previously owned a home are encouraged to apply if they and their prospective home qualify. No limits on cash contributions. Home must be occupied as your permanent residence.